Topher Limited announces the winning of security contract for TV compound and TV studios for Ryder Cup 2018. 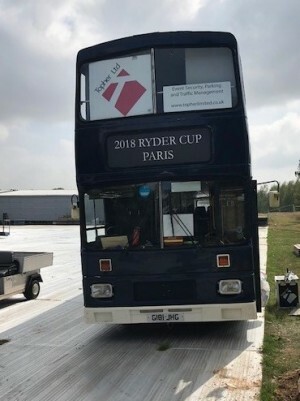 The event is taking place at Le Golf National in Paris. Topher has been fortunate to be working with IMG Ltd to provide security for TV compound and to be a part of the Ryder Cup for second time, previous one being held in Scotland in 2014. Topher will deploy its staff in Paris starting from 4th of September until 5th of October 2018. It is the first time Topher Limited has extended its service abroad and has been accredited with CNAPS (Conséil National des Activitées Privée de Sécurité) to provide security services in France. CNAPS is an organisation equivalent to SIA in the UK which regulates the permit to authorise company/person to carry out security activity in France.